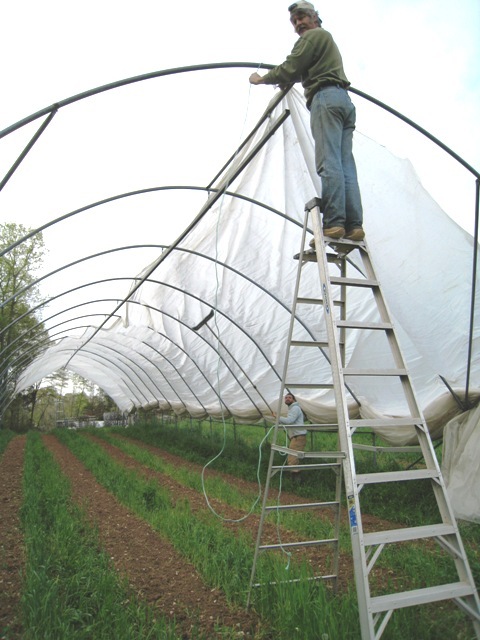 Today we are supposed to begin pulling the plastic over the Big Tops, the giant greenhouse structures that we grow tomatoes and some flowers under. As I sit here looking out the window I can see a slight breeze in the tops of the trees which may mean no covering this morning. 30 by 100 foot sheets of plastic make great sails and any breeze gets exciting when you think you could be carried across the river unless you let go. The Big Tops cannot take a snow load so we uncover them every fall, this also allows us to grow the important soil improving cover crops and recharge the soil with rainfall. We wait until as late as we can to cover them so we can get all the natural water into the soil possible before we have to start irrigating. This is all part of the inexorable march toward planting the main crop of tomatoes. The cover crop of wheat and crimson clover was turned under a month ago to give it time to decompose and begin to release its nutrients for the tomatoes to use. Last Friday we tilled the beds again, almost ready to cover with landscape fabric and build trellis but first we must pull the plastic roofs over as it is too hard to do with all the tomato trellises in the way. Once covered we can proceed with these preparations so that sometime next week we can tuck the plants into the ground. Timed to make sure we are after the last danger of frost, the transplants have been “in the system” for five weeks so that when they are planted they are at the best stage of growth so they can just take off without a pause. The first sungolds six weeks later, if the wind will hold off. With all of this rainy weather it is getting difficult to keep the guys busy but we keep having enough dry days to keep on schedule with planting. This week more lettuce and spinach and flowers made it into the ground. The pea trellises went up too. The big spring clean up push began with brush burning, all of the limbs that fall in the winter plus various prunings of the perennial plantings. Not only do we have to get ready to plant tomatoes but next week is the Farm Tour so we have to get buffed up for that too, lots to do. We were successful in getting the tomato Big Tops covered!